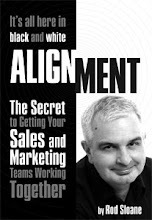 Sales and Marketing Alignment Blog from Rod Sloane: Be on time! Is there really any excuse to be late? Taking away the major exceptions of War and Terrorism is there any reason? Traffic and transport aren't, leave earlier. If you car breaks down or the train or plane are cancelled you probably have to reschedule. The weather isn't, Watch the forecast. Sorry no excuse for being late, just your bad planning and leaving lack of your time. There is no such thing as fashionably late in business. Five minutes early is on time!